The Westport Village Society hosts a number of events each year to support our mission. They include fundraisers for specific projects, as well as community outreach designed to share information about the natural and cultural history of the local area. Local history presentations, WVS meetings, and other community forums are held at the community hall on Abalone Street next to the school. 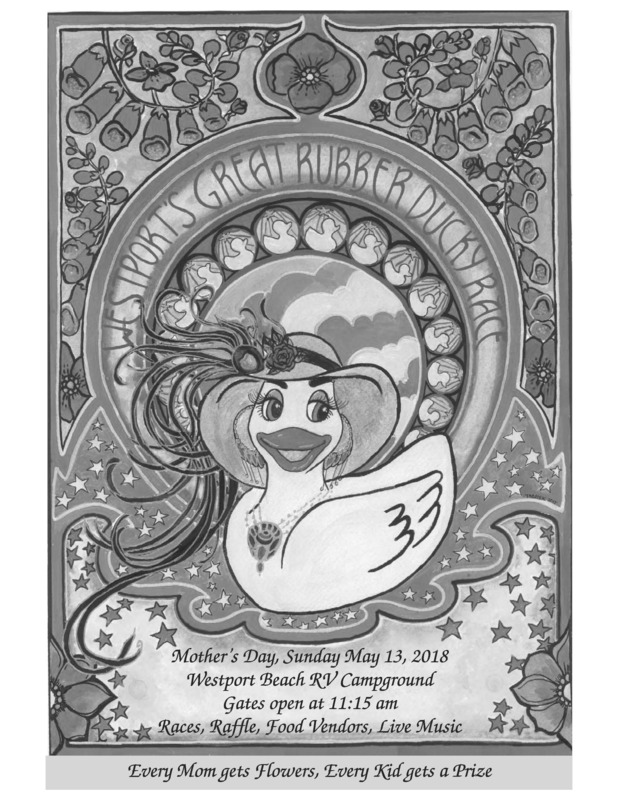 The Annual WVS Great Rubber Ducky Race will take place Sunday May 12th, 2019 at the Westport Beach RV Park & Campground north of the village of Westport, CA from 11:15 to 3:30 PM or so. Bring your Mom, children and anyone with a spirit of fun! This event is the primary WVS fundraiser held every year on Mother's Day since our nonprofit was first organized in 1992. We thank the Westport Beach RV Park and Campground for graciously hosting our event all these years! It is a fantastic venue and your distant friends from other places may enjoy camping here when they visit you! Bring Mom to Westport's Great Rubber Ducky Race on Sunday May 12, 2019. The gates Open at 11:15 am. 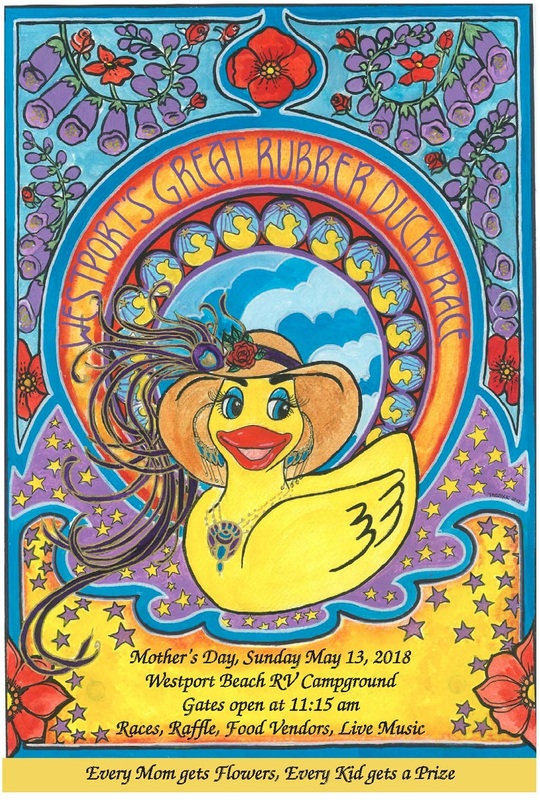 This fun family event features as always 3 separate ducky races, food by Sugar Coated Catering and Zocolove Collective, baked goods, mimosas, beautiful pots of flowers for mothers, raffles including a lovely handmade quilt, music, and prizes for kids. There will also be a fun consignment boutique for mom to get a little shopping in, as well as a raffle of beautifully decorated sunhats paired with gift certificates to local businesses. Music, merchandise, baked goods and drinks are available continuously. Registration for the races occurs from 11:30-2:15 PM. The 3 races start at 12:30 (handcrafted ducks); 1:30 (kids); and 2:15 (classic). The Decorated Duck Beauty Contest is judged at 1:15. Please enter your ducky well before that deadline. The Raffle drawings start at 3:00pm. The event Closes at 3:30pm. This fun-filled family event raises money for the WVS Headlands Fund, used to maintain the Headlands Property. This annual event is held the first Friday in October at the Westport Community Church. A notice will be provided here for the Oct. 5, 2018 meeting about a month before it occurs and that notice will include a membership renewal form. A social with snacks and refreshments typically begins at 6:30 PM, with the meeting following that at 7:00 PM to review the activities of the past year and our annual financial report. Directors are elected and a member forum is held to gather input on desirable projects for the future. This year we will focus discussion on Emergency Preparedness. This event began with a community yard sale on Memorial Day weekend several years ago. Based on popular interest, it has been expanded to provide market days in the summer, as well as a winter market and /craft fair in late November. Anyone can come and sell goods and farm produce. The local community and visitors are invited to shop from local vendors, contributing to the economic vitality of our village. For more about these markets visit the Westport Markets Facebook page or email westportcafleamarket@gmail.com. This fundraiser for the Westport Volunteer Fire Department will be hosted August 18th on the Westport Headlands from Noon until 7 PM. Come join the fun!! There will be lots of fun things to do.